Sensory Wise is travelling to Brunel University Uxbridge with their stand again at the AKO Autism Expo March 23. Sensorywise shares: It was a very family friendly event with the right pace for families arriving with their autistic children. I’ve been to many autism events and so many organisers miss the point and create an overwhelming environment that can’t be navigated by people with autism. KUDOS to AKO and Brunel University! I would like to share my experience as a SEN Parent during the transition time of my son (ASD and Cerebral palsy) from Primary School to Secondary School. After going through a very difficult time through inappropriate provision which broke down which resulted me keeping my son at home and I contacted the Charity under some very difficult and unforeseen circumstances. Within a matter of weeks with the support of one of the Charity Champions, who helped me through the process and she guided me through appropriate placements and the legal rights of my son, and drafted negotiations and explained the processes. The LA finally agreed to the specialist provision we had found and knew would meet our son’s needs and after months of turmoil my son finally got the education and support that he was entitled to. The Charity Champion handled the situation so perfectly and proved true professionalism at every stage and most of all I felt comforted during such a difficult time and also learnt so much about how the SEN process should work. We as family would like to thank Anna Kennedy Online and the Charity Champion from the bottom of our hearts and through this support and understanding, made all of our dreams come true.. I want to thank you from the bottom of my heart for arranging events like this. My father has just died after a long, awful battle with cancer… He was also a much loved and supportive grandfather to the children in our family and we all miss him. We are facing a very different Christmas this year and to have some respite from all the grief, legalities etc that we have been going through was just simply beautiful … It allowed our whole family to have fun. My Mum went and saw Santa as well as the children. So what you do not only touches the children, but also reaches out into the family too – giving us all a lovely experience. My Autistic son, who is normally quite deadpan and it more interested in the scenery and how the special effects work, was clapping and dancing in his seat and thoroughly enjoyed it. I looked around the audience and saw the vast range of different challenges that are faced by all our children and watched them laughing, singing and really getting involved. It was magical. Thank you once again, and I wish you well with your continued work.. it’s priceless. ‘A fabulous night from start to finish, with even a ‘quiet room’ on hand if or indeed when sensory overload became a little too burdensome. The AKO Awards was a lovely evening celebrating the extraordinary parents/carers/school staff/nurses and members of the public who do so much to support the autism community. In September 2017 my family received our little boys diagnosis of Autism Spectrum Condition. It was a very daunting time for us and we suddenly realised we had this whole new journey in front of us that we knew nothing about and was completely unfamiliar with. We quickly learned that there was a major lack of support information and direction. Then we were introduced to Anna Kennedy and her team via my very lovely sister in law Lisa Robins. And suddenly it felt as though a door had opened into a wider community of understanding and acceptance support and advice. We did not feel alone anymore. Anna and her amazing team gave us direction in a time of confusion and their help throughout our journey so far has been invaluable. Never got to say thank you for inviting me to the Brunel expo 2016. I just wanted to let you know what an absolute honour it was to be one of the finalists for the Outstanding Education Autism Hero awards and then to win it was a joy beyond words. The whole evening was so special – extremely well organised and totally inspirational. It will forever be one of the most important highlights of my teaching career and, indeed, my life. I have met Anna in person at an autism event in late 2017 and followed her on social media she is a powerhouse in knowledge and sharing. 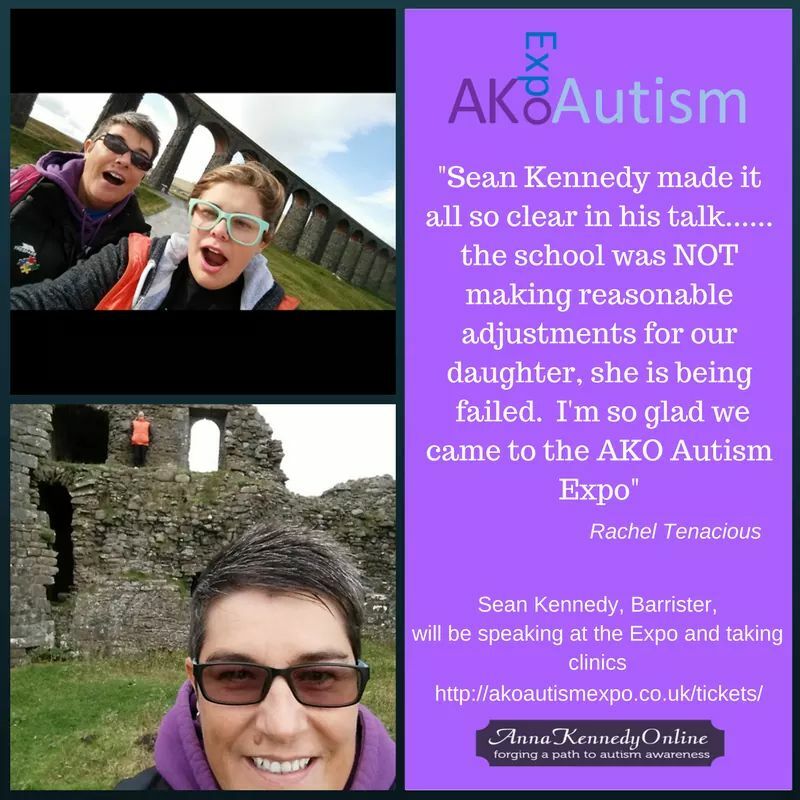 AKO Autism Expo 2018 was personal, professional and above all accessible for young people and families who want to learn more about autism. When I spoke young families came in with their children reflecting the strong sense of relaxation and calmness throughout the whole day. This all ties in with ethos and it is clear that Anna’s ethos is open, honest and transparent I believe Anna’s foundations are something that could (or should be!) translated into disability awareness policies in sharing information, something that in essence is so crucial. I enjoyed my day and look forward to coming back again. The AKO Autism Expo 2018 was an inspiring day full of passionate people committed to making a difference. Being lost in a world that I didn’t understand with my child whom was struggling at school and at home, the impact on our whole family has been immense. As a mom of six my attention was drawn off five of my children most of the time as my first son now five needs one on one adult supervision. The school were failing him, as was I and I didn’t know where to turn until I was put in contact with Nikki Rodregues Holmes. She has been a constant support and friend helping me deal with situations that I just didn’t understand and organise departments that were simply letting my son down because they could. She has attended meetings with me and given me untold amounts of practical, helpful advise to help manage my son. I know I can call her any time and she never makes me feel silly or unwelcome. I’m amazed by her strength and passion for her work. And this is just the beginning. I can’t say thank you enough. Your turning our lives around. Because of Nikki and the Annakennedy charity I’m no longer drowning in a world I don’t understand. I’m excited to learn more and be a part of it. I know my child can succeed along with all the other children with autism who have so much to give. With just the right backing. With Nikki and the Annakennedy charity I dream of a world one day when autism is not treated as taboo and is embrassed as the gift it is. Thank you again. Teachers, TA's and associated staff of Brunel Primary & Nursery Academy.